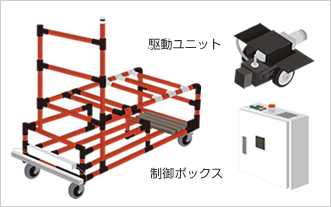 Kit Sales | AGV (automated guided vehicle), automatic guided vehicle system Aichi Machine Techno System Co., Ltd.
With the basic items such as the control box and the drive unit,you can convert your cart or vehicle into a custom-made AGV.Kit can be selected according to your prefernce,such as function(programmable/no programmable),loading weight and others. This is a simple and low-cost type. It repeats the same operation each time. AGV stops at where a mabnetic tape is cut by 50mm. AGV stops at where a spot marker is applied. 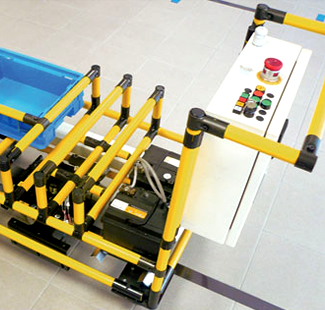 The combination of the number of spot markers and their positions can　stop AGV and change its speed. 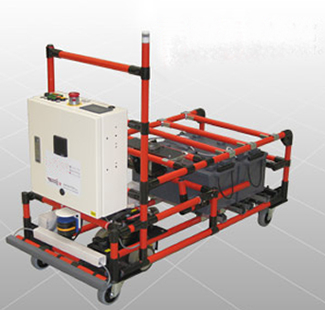 control AGV’s stop and speed change. It’s high-functional type which can memorize 100 route patterns and have many operation modes. Each marker has its unique number, programmed operations are executed when AGV identifies the number. 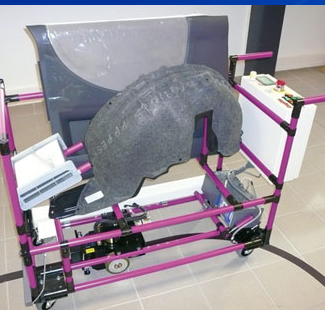 AGV counts markers from the start point and performs programmed operations according to the number of counts..